SUPERSTORE: OMG this show is so funny. 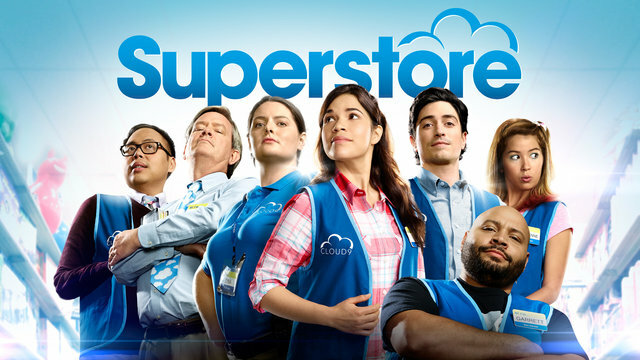 The cast is set in a store that is similar to WalMart and they are all so funny. I love the gay Filipino character Mateo because HELLO. FILIPINO AKO. The black guy Colton in a wheel chair is also hilarious, basically everyone is really funny. I think this is one of the few sitcoms that I like every character. It's from the same producer as the Office so if you like that dynamic and timing you will like this show. The diverse case is a major plus. To get me through the day I listen to multiple podcasts and Desus and Mero is one. THANK GOD Viceland gave them their own TV show because this is how I was able to keep up with current events in a hilarious way. On their podcast they mention a lot of current or twitter current stories so it elevates the humor to be able to hear them talk about memes and other stories with visuals. They are so funny together I hope this show is on forever. 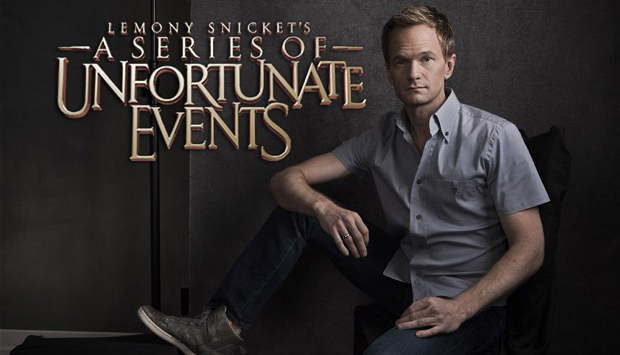 I kept seeing stories about A Series of Unfortunate Events and I thought they were just talking about the movie but netflix put together an amazing 8 episode series with NEIL PATRICK HARRIS and it is excellent. I read the books when I was younger and this deviates a little but is very entertaining. No need to read the book to understand what is going it, it is a great series and the story telling is really good. 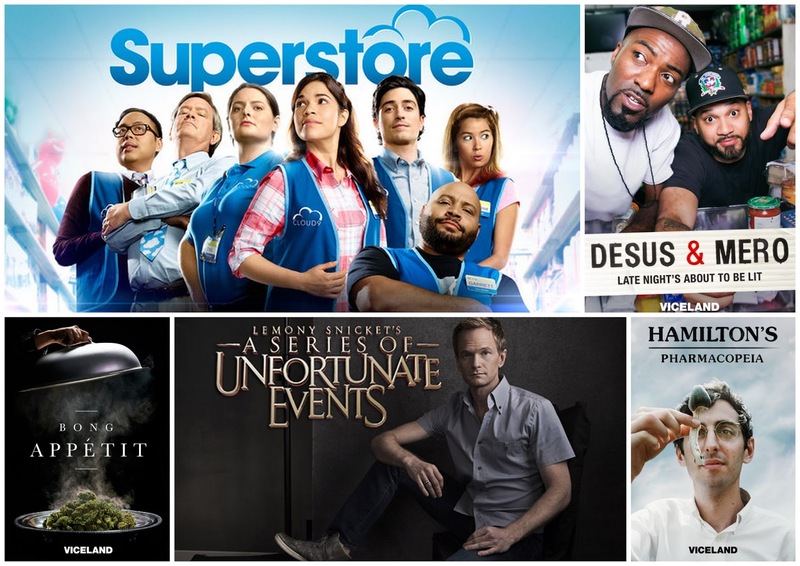 NPH is really talented, Count Olaf is a character who is trying to adopt these kids whose parents died so he can be in control of their fortune. Very, very unfortunate things keep happening to these kids, this was not a happy book series and the show is in line with that. I really enjoyed it and NPH was actually a great Olaf. In the series Olaf is a very bad actor so to take the kids back he will try to dress as other people to try to essentially kidnap them. Its so good, just watch. In continuing my Viceland viewership Bong Appetit is a really interesting show. The host Abdullah hosts dinner parties while using THC and CBD as elements. Now, every time I tweet about this I mention I have never done any drugs a day in my life, but the range of flavors of Turpines and uses for THC and CBD has been really fascinating to learn about. Ry Prichard is basically a chemist so hearing him talk about levels for keeping food balanced is really cool to see. From the show I have learned that THC is the psychoactive ingredient in weed and CBD actually helps bring you down in a sense so Ry spends a lot of time in the show balancing the 2 to create a euphoric dining experience. Abdullah has also made it a point to sneak in people at the dinner table who are benefiting from the medicinal factors CBD has for them. People with Crohns and ALS have been featured that really function through life better with this drug in their life. Definitely a cool twist on a normal cooking show. 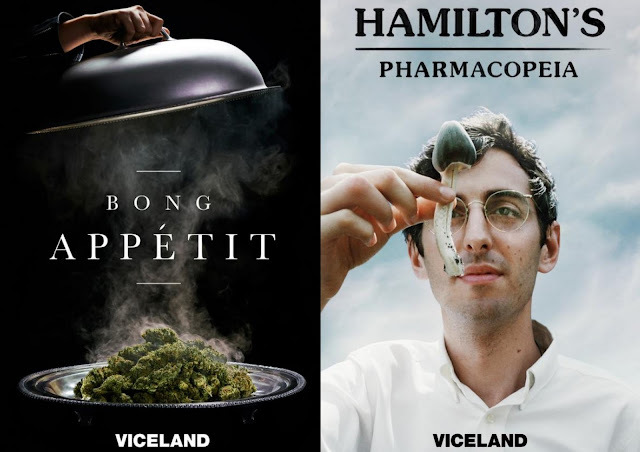 To follow the educational paraphernalia theme Hamilton's Pharmacopeia is a really random show about Hamilton Morris, a journalist and researcher who is fascinated by psychoactive drugs. In the show he does a lot of pharmacological research on many different subjects. He has traveled to South Africa to research the Quaalude and stir the pot of government conspiracy. A lot of these drugs are obviously formulated by chemists so it is easy, especially when the government is involved, to think that these are manufactured and spread to eradicate or genocide parts of the population. That in itself is interesting to read about. He has also traveled across continents to study hallucinogenic fish. It's overall a really good show and you an tell he is thoroughly researching these topics in an interesting way. Oh and he's like 29. 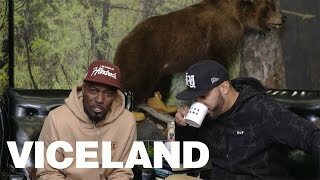 Shoutout to Viceland for awesome alternative TV shows.